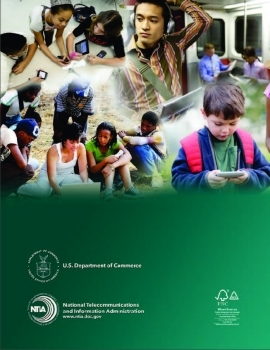 A report released today by the U.S. Commerce Department’s National Telecommunications and Information Administration (NTIA) found that Americans are rapidly embracing mobile Internet devices such as smart phones and tablet computers for a wide range of activities beyond just voice communications, such as checking email and using social networks. NTIA’s “Exploring the Digital Nation: Embracing the Mobile Internet,” which is based on a U.S. Census Bureau survey in October 2012 of more than 53,000 households, found that Americans were increasingly using their mobile devices to engage in applications that they might have previously done on a desktop or laptop computer or not at all. Between July 2011 and October 2012, the report found big increases in mobile phone users 25 and older who used their devices to download mobile applications (22 percent to 32 percent), browse the Web (33 percent to 42 percent), check their email (33 percent to 43 percent), and use social networks (22 percent to 30 percent). Mobile phones appear to be helping to narrow the digital divide, the gap between the technology haves and have nots, among traditionally disadvantaged groups. Mobile phone use among those with family incomes below $25,000 and among disabled Americans each increased by 4 percentage points, growing from 73 percent to 77 percent and from 68 percent to 72 percent, respectively. Similarly, mobile phone use among seniors 65 and older grew by 4 percentage points between 2011 and 2012, from 68 percent to 72 percent. Disparities in mobile phone adoption that remained between whites and minorities appeared to nearly vanish between 2011 and 2012. The report found that 88 percent of whites reported using mobile phones in 2012, compared with 87 percent of both African Americans and Hispanics. Mobile phone use among rural Americans also grew by 5 percentage points to 85 percent between 2011 and 2012. Mobile phone use among urban Americans increased more slowly during this same period, from 86 percent to 88 percent, matching the 2 percentage-point increase to 88 percent in mobile phone use among all Americans 25 and older.